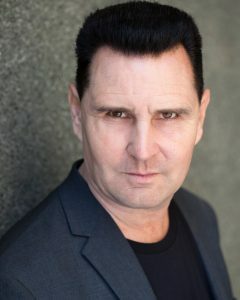 British actor Christopher Lee Power studied acting at Richmond Drama School in London and was awarded a Diploma in Acting from Oxford University in 1996. He also attended The Lee Strasberg Theatre & Film Institute and RADA. Christopher will be playing Zodda in a new fantasy film called Consciousness. 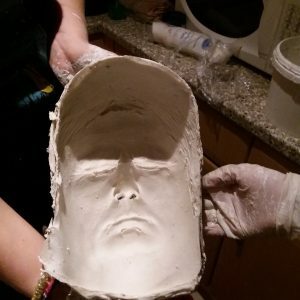 A mold is taken, ready for the mask. He built a successful career as a theater actor in the North West of England, his memorable roles included Shakespeare- and Chekhov-characters ranging from Polixenes, Claudius, Mark Antony, King Duncan to Astrov in Uncle Vanya. He toured in London with ‘A Midsummer Night’s Dream’ with the ‘Young People’s Shakespeare Theater Company’ as Quince and Egeus. His most recent role was King Duncan in Macbeth at St George’s Hall in Liverpool. Christopher has recently filmed 9 episodes in Season 3 of the children’s TV drama Jovis and played the lovable villain Mr. Bosanti Crayco. His other TV credits include Coronation Street, Titanic- Birth of a Legend (ITV), Brookside, Hollyoaks and Mystery Files (Sky TV). 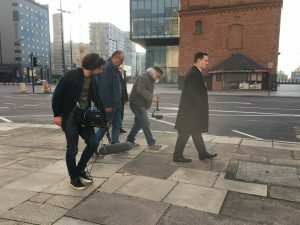 BBC Real Stories (Lawyer) Channel 4s The Courtroom. He played Colin Jarvis in the award-winning feature film For Love’s Sake and Mark Antony in a short thriller film called Caesar which was well received. Christopher has also appeared on many TV Chat shows, radio and had many features in newspapers and magazines talking about his book and acting career. Christopher was drawn to set up the Power Foundation to enable young people to benefit from access to the arts. Copyright © 2019 The Power Foundation for Young People.